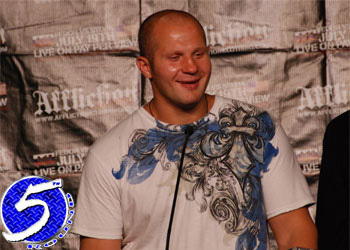 If recent reports hold true, Fedor Emeilianenko will never appear inside the Octagon while in his prime. According to M-1 Global director of operations Evgeni Kogan, Emelianenko, who turns 34 next month, is very close to inking a contract extension to remain with Strikeforce. “I think the talks are going well. There are always things to get sorted and ironed out, but we are probably two-thirds of the way there,” Kogan told MMAFighting.com Thursday afternoon. “I think that the next fight and the deal overall will be announced at the same time, within the next month. We have an [M-1 Selection] event in [Atlantic City,] New Jersey on September 18th and we may be ready to announce by then. Over the weekend, Emelianenko attended the semi-finals of M-1 Global’s tournament where he said he would focus his attention on Strikeforce and that he “didn’t have any interest in the UFC” due to the one fight remaining on his current deal with the San Jose, California based promotion. It appears his disinterest in joining the world’s premier MMA organization has gained momentum after UFC president Dana White claimed he was no longer “obsessed” with bringing “The Last Emperor” into his Octagon. After getting derailed by Fabricio Werdum earlier this summer, White quickly hopped off his bandwagon and it seems as though the feeling is mutual. So much so, that the Russians won’t even bother with hitting the free agent market or talking to UFC brass. So, how anxious is your meal ticket to get back to action after his unprecedented 27-fight winning streak was abruptly snapped? Considering Werdum is expected to be out until 2011, that means mixed martial arts fanatics will finally get to witness the long awaited scrap between Fedor and Strikeforce heavyweight champ Alistair Overeem, right? Earlier this week, Strikeforce CEO Scott Coker told Ariel Helwani of MMA Hour that he didn’t think the blockbuster bout would go down this year, however wasn’t willing to rule it out completely.